Hi guys and thank you for all the advice! What oil products would you recommend to increase intuition/psychic abilities, to contact with spirit guides/angels ? especially psychic abilities and intuition. You can order any or all of these right here in the forum by clicking on the blue dd To Cart buttons. thanks all of you for your help/replies. I am particularly fond of mixing Psychic Vision Oil with the Spirit Guide or Master Key Oils before starting any Divination work. I have never heard about that there is an oil which helps us to increase our intuition and our psychic abilities. markwillson wrote: I have never heard about that there is an oil which helps us to increase our intuition and our psychic abilities. now you do. the recommendations are up there. Yes, you are right Sun369. All credit goes to you. I have been a lurker on the Lucky Mojo site and a listener to the radio show off and on for a couple of years. My main interest has been psychic development and divination. I have been able to have contact with my own deceased family members, but have never been able to have spirit contact (that I know of anyway) and get messages for others, which is something I really want to learn how to do. 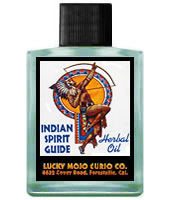 I recently ordered Psychic Vision, Spirit Guide, and Clarity oils from Lucky Mojo and began working with them, mostly by anointing my third eye. I also ordered some althea after reading about its properties. I placed some in a bowl next to a bowl of water on my altar early last week. Within three days, I had a vivid dream that really shook me up. I didn't understand it at the time, but found out later on the day after I had the dream that a friend of my significant other had passed away, and the dream was a message for him. The person in my dream was the person who had passed away (that I had never met) and I was able to confirm this after seeing his picture on the funeral home's website. I was absolutely blown away. My significant other is open minded but yet very skeptical about these things, and I had been praying for a long time that I could help him truly understand that our loved ones are still with us after they pass. This experience has made a huge impact on both of our spiritual lives. I firmly believe that these products from Lucky Mojo gave me the extra "push" that I needed. I am looking forward to learning more about hoodoo and developing my intuition even more. This stuff works, people!! Blessings to all of you at Lucky Mojo for all that you do! That is one of the best posts I've read all week! Congratulations to you and good luck on your continued work/experiences! It was a very touching and humbling experience. It's one thing to experience these things for yourself, but to be able to help someone else by giving them a message from the other side, well, that was one of the most gratifying things I have ever done. I have also worked a few spells here and there for myself for love, money, and clarity and have had some success, but this experience by far was the most amazing. I have ordered products from other companies that ended up looking and smelling artificial. The things I have ordered from Lucky Mojo are the real deal, and I am excited about working with LM products even more in the future! Thanks so much for the endorsement. We make each item by hand and with intention and prayers, and we are very happy when folks tell us they appreciate the supplies we send them. Thank you for sharing this blessing you have experienced. If I want to contact my deceased relatives like a medium who channels dead people., can I use these oils too ? Yes, you can use those oils. You might also work with Archangel Gabriel, the angel of dreams and visions. I am continuing to get good results with Psychic Vision and other products from LM, and that has given me the confidence I needed to do more work on the behalf of others. Maybe the following testimonial belongs in another place, but I did a freezer spell for my sister with amazing results. She was being harassed/bullied by a co-worker and within days of doing the spell this person has hardly spoken to her. I followed the instructions on the freezer spell page on the Lucky Mojo site, using a lemon, and it totally worked. My skeptical sister is a believer now! It was so gratifying to be able to help her and I hope more opportunities will arise where I can help others in this way. I am typical "airy Libra" who lives inside my head a lot of the time, and I think doing hands on spellwork with Lucky Mojo products is just what I needed to further my development. Thanks and blessings to all of you at LM! A psychic told me i haven't tapped into my psychic abilities yet. This is not the first time i have heard this from a reader. How can i do so? I am aware that some people are more gifted than others and it doesn't happen overnight. Any suggestions? Working with a pendulum offers instant gratification - you don't have to memorize or study, you can just jump in and work with your intuition right away! From there, you can delve into more complex forms of divination.. Divination/psychic work/being a reader is a beautiful path and one that I have never lost interest in, even after 38 years of study (beginning when I was 10!) I have never felt like there wasn't more to learn and explore! Best of luck on your joyful journey! In addition to Madame Pamita's excellent advice, you can also work with the Psychic Vision spell kit to kick-start things into gear. The kit comes with everything you need to do the work: http://www.luckymojo.com/spell-psychic-vision.html and a mojo hand that can help you develop your gifts in an on-going manner. Dreams are a natural pathway into your subconcious mind as is automatic writing. Working with morning pages (a few, usually three, pages of stream of consciousness writing upon waking up in the morning) and/or a dream journal can help begin to unblock things by allowing a daily space for intuition to emerge. You can also work with Master Key to improve any magical skills, including divination. Thank you ladies! I'm kind of afraid to start seeing things but if God gave me the gift, why not use it. Question... I've been using the psychic oil to dress myself and lately I've been seeing past events of my life more clearer now. What I mean about "clearer" is that I have better understanding of what went on. Do you think that's just me getting older and having more sense or maybe from using the psychic oil? I plan on burning a psychic candle on me next using the oil. It may be both. Keep working on developing your skill and in time you'll be able to discern which insights are coming from Spirit. I started with the Triple Strength Psychic Vision Mojo and found it to be tremendously helpful. I've had it for years and work with it all the time...in fact it's in my pocket right now! Thank you for taking time out to reply -JR-. I believe it is as well. I will take your advance and hopefully be able to see as much as you do. I appreciate that this thread has started, and will be checking back in regularly for the suggestions and advice from the experienced and esteemed folks here. I recently have been telling my own mentors, colleagues, and readers here in town about my pull to get back into intuitive and psychic work, and nearly all of them hit me with a version of "well it's about time!"... more reason to have good mentors and teachers -- they often can see what talents, and weaknesses, you have that you can't... and know how to encourage you or give you a good shake when you're not feeling sure. I have a stack of LMCC publications on my list to order, in the spirit of giving new methods a try. I'm looking forward to it. 1) Set the scene. Use candles or oil lamps, not bright electric lights. If you must use electric lights, use the smaller wattages, such as 10, 15, or 20 watt. 2) Fragrance can take the form of oils, incense, an oil-diffuser, or a room spray made by combining an oil such as Psychic Vision or Master Key with a spiritual cologne, such as Kananga (for contact with the dead) or Peace water (for tranquility while seeing visions), shaking them up into a temporary emulsion, and spritzing them to the four corners of the room. 3) Dress your tools. You may use oils or incense, depending on what the tools are made of and what you prefer. 4) Arrange for a quiet time. No cell phone, no television in the room next door, turn off the air conditioning or forced air heat if you possibly can. 5) Set a start and stop time and mark them with sound. Ring a bell or a gong, rap the table three times, intone or hum a single note, or clap your hands. Have a clock nearby, one you can read without having to move to see the time. As you come out of your reading, contact, or visonary experiment, note the time. Then close with another sound, as you began. Make a note of how long the session lasted. If it was less than ten minutes, try to work up slowly each time until you reach 15 or 20 minutes, whichever feels right for you. Here is the situation: There was someone that I used to have deep feelings for, and for a long time, I believed that they reciprocated those feelings as well, but couldn't act upon them because of some external factors. Long story short, somewhere along the line, our friendship turned cold and I'm still not sure why he had such a change of heart. While I've technically moved onto someone else, there is a part of me that wishes I could know what exactly happened between us, and what was going through his mind. I'd like to know if there's a spell that could get him to confess/admit his thoughts/feelings about me and what happened between us? I just want some clarity on why he acted the way he did, and this may involve, in a sense, reading his mind. I don't want him to come back to me, but I need to know what caused his to act like he did and what he believes I did (if anything) to cause his behavior. 1) Can I cast 2 spells at the same time (by this, I don't mean actually casting them at the same time, but having them work at the same time)? If I have performed a love spell on someone recently, but want to perform a different kind of spell on someone else, is that okay and will both spells still be effective and accurate? 2) What kind of spell could I use to gain clarity, or a better psychic understanding of his inner feelings? 2) What you seem to be asking for is a spell to first increase your command of psychism to the point that you can perform a reading on the "someone" and then for instructions on how to perform the reading. This is a very tall order. You could do a spell of compelling and clarity so that the person will speak the truth. You could do a spell of psychic vision so that you can learn how to, for instance, read cards on the person. Or you can do as starry moonlit night suggested and simply pay a professional reader to look at the situation. Some ways that you could work with Clarity products: bathe yourself (particularly your head) in a bath with Clarity bath crystals, anoint yourself with Clarity oil, dust a white candle with Clarity powders and let it burn down, meditating/praying for clarity in this situation, praying to receive only the highest truth. Best of luck in your works! I do a lot of dream work. Wondering if there was a specific oil, essence, herb, and/or mineral that would assist me in materializing visions into physical reality? Was going to just opt for one of these used in attraction spells but thought there might be an option geared more toward manifestation. For the dreaming, Miss Aida has already given you the primo link You can also work with a dream sachet stuffed with herbs such as mugwort, hops and poppy petals. For materializing visions and wishes more specifically, you're on the right track with the Attraction work. Magnet and lodestone are two similar formulas to consider. Working with a large specimen-sized lodestone for materializing goals and items is also a really wonderful way of doing things. Make sure you also have photographs and/or small replicas of what you wish to manifest - they help a lot. Finally, adding a bit of Victory Oil (or another more adapted oïl to the specific desire such as Power oïl or Wealthy Way oïl) to the mix can also help customize the work to the purpose. So, with the Psychic Vision glass candle, rather than using it a nine day spell, would it be a good idea to light it as you meditate in order to increase one's psychic abilities? Also, can anyone recommend any good meditations for psychism? Not necessarily just ESP, but also other powers like telekinesis. Yes, you can do that. But the idea of the 9 days spell is for it to stay with you. Maybe consider going the 9 day candle and then doing another one like you had suggested? Go the to AIRR page and browse through their volumes of suggestions on almost everything. It's a GREAT website! You might find some ideas there. I would like to know what is your logic/reasoning for recommending Clarity and Good Luck oils in addition to Psychic Vision, Spirit Guides ? Especially Good Luck oil, what does it do with psychic ability ? Good Luck: Allow you to convey the good/necessary in whatever you read, to make the reading relevant and helpful to the client (it takes a lot of skill and a little luck to do that in some cases!). Attract good clients who are receptive and exchange well. Generally bless the Divinatory endeavour with Good Luck (you can never have too much luck). Keeps things positive. Hmm....I dont work spiritually for people and dont read for people. I only do this kind of stuff for myself. Yes, I have been using Psychic Vision, Angel, Spirit Guide and Master Key. Not sure if I should use Clarity or Good Luck or not because I only read for myself. The term: "Client" can also mean yourself if you are reading for yourself. But using Good Luck to attract myself to read for myself. This is funny ! So, what would you say if I add ALL THREE: King Solomon Wisdom, Clarity and Power Oil to the combination of Spirit Guides, Psychic Vision, Master Key that I already used. Would Power oil increase the strenth in this case ? Hi, all. 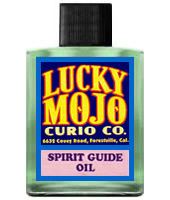 I am interested in Lucky Mojo oils (specifically) that I could anoint myself with to aid in my Tarot card readings. Something that might strengthen divination, maybe cleanse any negative influences that may block me from getting an accurate reading. 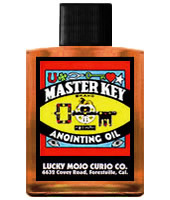 Would the Master Key oil be a good selection for this? 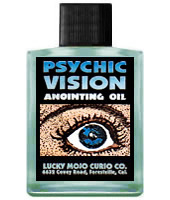 The Psychic Vision oil? A combination of both, or another oil altogether? What would you guys suggest? SaintsCrossing, in addition to reading this thread on Increasing Psychic Reading Visionary Ability, please read through this thread, Tarot, Tarocchi, Tarock Card Reading Questions and Answers and you will get several more recommendations from workers. I like to use psychic vision and King Solomon Wisdom oil. The king Solomon wisdom oil helps me to accurately interrupt my readings. I've read the Tarot since my childhood. I can read for other people perfectly. The story I'm meant to tell comes almost instantly and my intuition speaks loud and clear. Everything works fine. When I start a reading for myself, however, everything stops. My intuition doesn't flow the way it does when I read for other people. Cards with more flexible interpretations become muddled, things don't make sense and I end up having to pull more clarification cards than I would like. Could it be that I'm to close to the situation? Maybe my energy is trying to force a scenario? Have any of y'all had this problem, and if so, how did you solve it? Ana, yes, it could be that you are too close to the situation. It could also be that you are simply not gifted to read for yourself. Try some of the suggestions in this thread and perhaps you will experience a breakthrough that will enble you you to read for yourself. If not, you can do as many people with either of these problems do, and simply go to a professional reader, even if you are a professional reader yourself. That would be a really nice combination of oils - the Power is a great addition to improve your own personal confidence in your reading ability (more than to increase the strength of the blend - trust me, the oils are PLENTY strong enough without any help! ).